About American Machine & Gundrilling, Inc. 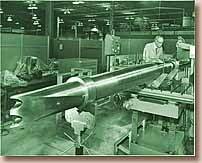 Since the company was co-founded in 1976 by Charles D. Berg and his cousin Larry Berg, American Machine & Gundrilling, Inc., has specialized in deep hole drilling. Due to the difficult nature of gundrilling, American Machine & Gundrilling, Inc. has thrived using all the experience and skill of its owners and machinists to provide their customers with a quality product at a reasonable price. The foundation of the company goes back to American Machine & Tool Company, founded by Carl A. Berg (Chuck's father), who was one of the co-founders of the the MTMA/MPMA and a legend in the Minnesota manufacturing community. With Carl in their corner, Chuck & Larry formed American Machine & Gundrilling, Inc. to capture a part of the market that was ready to be expanded. Now working with his son, Chuck Jr., the company started a new chapter in this family run business. In 1992 they purchased a modern, spacious manufacturing facility in Maple Grove. They also are utilizing the latest equipment available to achieve hole diameters of .078" – 2.75" and lifting capabilities of 2 oz. – 20,000 lbs. All things combined, American Machine & Gundrilling, Inc. is a staple machining supplier for Minnesota and the rest of the country with service that Is second to none.